Does the NFL Still Need the 'Rooney Rule'? New York Giants defensive coordinator Perry Fewell was the "it" black candidate this off-season when it came to NFL head-coaching vacancies. Fewell interviewed for the top job with the Carolina Panthers, Denver Broncos and Cleveland Browns, all of whom hired someone else. His full slate was due to two factors, his status as a highly regarded coordinator and the NFL's "Rooney Rule," which requires teams to consider minority candidates for head coach and general manager openings. Established in 2003, the rule has been wildly successful. 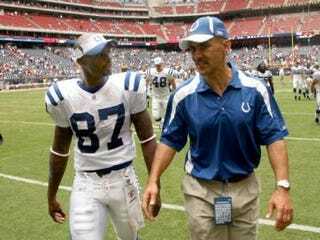 Former Indianapolis Colts head coach Tony Dungy was the only black coach when it began; now there are eight minority coaches. This off-season marks the first time that three minority coaches were picked in the hiring cycle (Minnesota's Leslie Frazier, Carolina's Ron Rivera and Oakland's Hue Jackson), and the first time that the majority of head coach job openings (three out of five) were filled by minorities. Yet, there are those who question the policy's effectiveness, while others conclude that it has run its course. Skeptics and critics complain that coaches are granted "token interviews" to fulfill the mandate, when teams know all along they plan to hire someone else. Another common argument is that the rule served its purpose and is no longer necessary, because teams will now naturally consider minority candidates without being forced. Attorney Cyrus Mehri scoffs at both notions. "We have not reached the promised land," says Mehri, who teamed with the late Johnnie Cochran to put the policy in place. "There's a lot of hard work to be done, and it's an uphill battle every hiring cycle. We're still trying to open people's minds. We're in the process of changing the hearts and minds of NFL owners and, in turn, trying to open the hearts and minds of America." You might think the NFL owners get it by now. Of the eight teams in the last four Super Bowls, six of them had a black head coach or general manager. Two of the four teams left in this year's playoffs have black coaches (Pittsburgh's Mike Tomlin and Chicago's Lovie Smith), creating the possibility that the Super Bowl will feature a pair of minority coaches for the second time in five seasons. The director of football operations for Green Bay, another Super Bowl contender, Reggie MacKenzie, is also black. Minority general managers whose teams reached the Super Bowl include the Giants' Jerry Reese, Arizona Cardinals' Rod Graves and Baltimore Ravens' Ozzie Newsome. "All of those men [except Newsome] came in under the Rooney Rule framework," Mehri says. "All of them would have been easily overlooked and likely overlooked without the Rooney Rule. That's the power of diversity. It has helped white candidates below the radar get selected as head coach, too. The rule forced owners to cast a wide net, going from a who-you-know system to a who's-the-best system." In a new book, Advancing the Ball: Race, Reformation, and the Quest for Equal Coaching Opportunity in the NFL, Temple law professor N. Jeremi Duru outlines the process in which a group of lawyers and grizzled NFL players came together to force change in America's most popular league. "The main thing to take away is what this sort of movement might mean outside the NFL," says Duru, who worked in Mehri's office when this "mini civil rights movement," as he describes it, began to bloom. "A number of institutions are becoming enthusiastic about diversity and diverse candidate slates outside the NFL. What has worked to diversify this historically homogeneous institution can serve to diversify other institutions." There's no good reason to end the Rooney Rule, and there's no way to deny that it's been tremendously successful. Some teams follow it more robustly than others, but there's no provision against having a nonminority front-runner going into the process. As for "token interviews," both Minnesota's Frazier and Carolina's Rivera interviewed for multiple jobs before landing one this off-season. After Frazier interviewed with Bill Parcells, then executive vice president of football operations for the Miami Dolphins, and lost out on the job to Tony Sparano, Parcells said that Frazier had all the ingredients and would make an excellent coach. That surely didn't hurt Frazier's standing in the eyes of other teams. The Fritz Pollard Alliance, an advocacy group of coaches and front-office executives, works hard and quietly behind the scenes to make sure qualified candidates get a fair shot. It keeps a "ready" list for all open positions — including head coaches, coordinators, position coaches and front-office personnel — to show owners there are viable minority candidates, to whom the alliance provides feedback and mentors. Teams are required to interview at least one minority candidate for head coach and general manager openings, but are not required to hire one. What's so wrong with that? "We're fooling ourselves," Mehri says, "if we think we can stop [the Rooney Rule] and the success will continue on its own." Deron Snyder, an award-winning journalist who covers sports, politics and pop culture, is a regular contributor to The Root. He can be reached at deron@blackdoorventures.com.